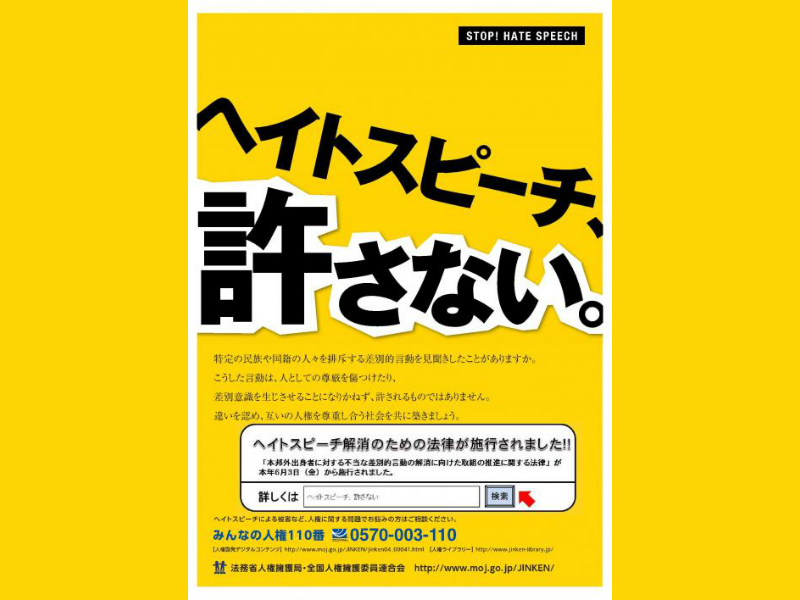 “Stop hate speech!”  Poster created by the Japanese Ministry of Justice to address hate speech. The absence of measures to control online hate speech discourages freedom of expression among ethnic minorities in Japan, especially resident Koreans , according to a series of reports  published by Kanagawa Shimbun, a regional newspaper. The report details how online hate speech makes non-Japanese residents in the country uncomfortable online. While various city, regional and national efforts have been made to address hate speech, Twitter Japan has been slow to respond, prompting demonstrators  to gather on September 8 in front of Twitter's head office in Japan, asking for stronger measures against hate speech on the popular social media platform. Kanagawa Shimbun, which serves the city of Yokohama and the rest of Kanagawa, Japan's second-most populated prefecture beside neighboring Tokyo, has been covering community efforts to fight against hate speech in the city of Kawasaki, which promotes multiculturalism  with foreign residents accounting for 2%  of its population. In a December 1 article , Kanagawa Shimbun writes that while online hate speech in Japan targets almost anyone, it particularly impacts ethnic Koreans, and especially in real life . The article cites a survey showing a much higher ratio of survey takers of Korean origin refraining from internet usage for fear of seeing hateful comments. Expressions of hate speech have stoked tensions  between Japan and neighboring countries, leading to claims that Japan is not following its obligations  under the UN's International Convention  on the Elimination of All Forms of Racial Discrimination. Kanagawa Shimbun published an online article  denouncing these remarks and highlighted a third-generation Korean-Japanese mother who used to enjoy Twitter until she and her son became victims of multiple defamatory comments. The Yokohama District Legal Affair Burea eventually ordered them to be deleted  but she felt forced to stop using Twitter, after continuous hateful comments. The law delegates local municipalities to implement measures to eliminate hate speech. The city of Kawasaki was one of Japan's first municipalities  to compile guidelines aimed at preventing hate speech at public facilities operated by the city. However, when it comes to online hate speech, it is not clear to what extent government agencies have power. However, the law does not criminalize hate speech, and local municipalities claim they have little power  or resources to address hateful online content. While the Japanese government is also working on implementing an information technology strategy  to match an already roaring digital civic sphere and make Japan “one of the world's most advanced IT nations”, so far little has been done to tackle online hate speech. Japan is one the top five markets  for Twitter in terms of active users, making the platform more popular than Facebook . Like in other countries, a lot of political discussion in Japan happens on Twitter, including the spread of misinformation, especially during elections . Just like the recent accusations by female comedians  against Facebook that they are silencing women while so many violent comments by men are left visible, some users in Japan speculate that Twitter Japan puts unfair pressure on progressive influencers, especially seeing racist trolls kept active, reminding users that Twitter is just another service of a private company rather than a public space for free speech. Since October, Twitter headquarters in the USA has been working to update  its rules for creating safer online spaces including measures to heighten transparency on political ads and provide clearer account suspension processes. Twitter's global council of safety partners  will implement these changes but Japan's partners are limited to suicide prevention organizations.